A one-handle faucet is designed to be a better way to get the ideal water temperature. Rather than fiddling with a balance between hot and cold, you can simple adjust it through the different temperatures until the ideal one is found. One-handle hot and cold faucets can also come with something called a scald guard, controlled by an adjustable knob. This prevents water becoming dangerously hot. However, if this scald guard is set too high or is malfunctioning, your one-handle kitchen faucet can end up feeling far too hot. On A Single Handle Faucet, Which Way Is Hot? The first thing to check when adjusting a faucet is which side is hot water on your sink. Typically, on a double knob faucet, the tap on the right controls hot water, whilst the tap on the left controls cool water. The same rule applies to a one-handle faucet. Shifting the handle to the right will heighten temperature, while shifting to the left will cool it down. 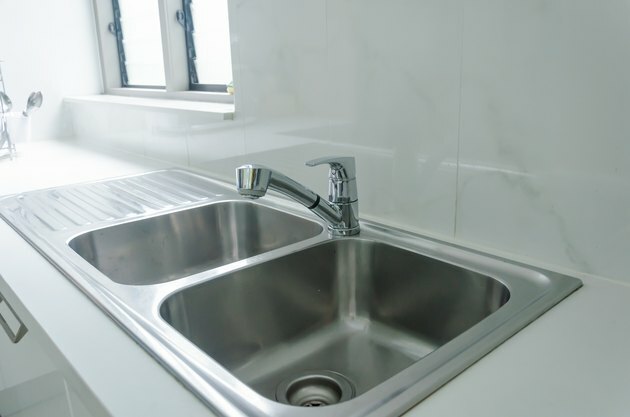 If your tap has been installed in the opposite way, remember to keep this in mind when adjusting temperature in order to avoid making the water hotter than you want. Why Might Your Faucet Be Too Hot? There are two main reasons a single handle faucet may be producing hotter water than you need. The first is that the water mixture is wrong—you're getting far more from the hot valve than the cold, and thus no matter how much you turn the handle to the cool side, an abundance of hot water still comes through. The other reason is that the scald guard has been set at too high a temperature. The scalp guard is usually in the form of a plastic disk, which stops you from turning the faucet too far in one direction. If it is set unreasonably high, or is worn out, your faucet can end up producing dangerously hot water. To adjust your water mixture, you first need to remove your single handle. This is done by loosening the screw holding it in place. You'll see two screws under the handle—usually the screw on the left controls hot water, and the screw on the right controls hot water. To lower water temperature, you either need to tighten the hot water screw, or loosen the cold water screw. Replace the faucet and test your new water temperature with a thermometer (never your hand). To adjust your scald guard, you also first need to remove your faucet handle. You do this by loosening the screw with an Allen wrench. You can then pull the handle off the faucet. The adjustment control dial is now visible on the handle. The scald guard looks like a plastic disc with a notch which catches on the handle. Turn the dial on this temperature control towards the cooler side of the faucet (usually to the left). Replace your handle and tighten the screw. You can now test your water at the highest temperature by turning the tap to its hottest and taking the water temperature. If it's still too hot, you can adjust accordingly.